The fifth time was a winner for Andy Murray, who finally won a Grand Slam event after losing his first four finals, defeating Novak Djokovic in a five-set marathon in the U.S. Open Men’s Finals. Murray is the first player to win the U.S. Open and an Olympic gold medal in the same year and the first British man to win a Grand Slam since Fred Perry won the 1936 U.S. Championship. Murray won the first set tiebreak, 12-10. That's the longest tiebreak in terms of points in US Open Final history. He’s the first player other than Roger Federer, Rafael Nadal, or Novak Djokovic to win a Grand Slam title since Juan Martin del Potro at 2009 US Open. The 4-hour, 54-minute match time is tied for longest in final in US Open history (Mats Wilander defeated Ivan Lendl in 1988). 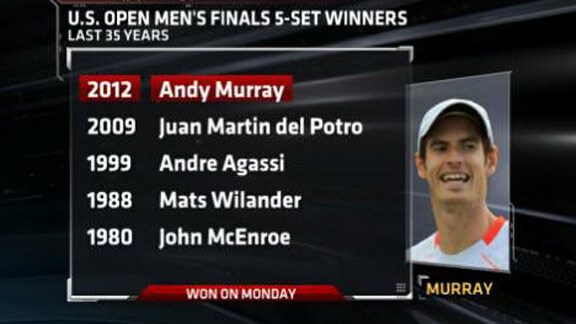 Murray joined del Potro as the only five-set winners in the U.S. Open Finals since 2000.